Chair Size 15.9" x 16.5" x 17.5"
Scale Size 35.9" x 20" x 35"
Sturdy Arm And Foot RestsThis Seca chair scale has sturdy arm and foot rests that conveniently slide out of the way when getting in and out of the seat. This makes weighing a little more comfy and safe. It's Rechargeable!Ya won't have to worry about searching for a wall outlet or batteries for this medical scale. The Seca 954 comes complete with rechargeable batteries and charger, so ya can get weights of patients wherever ya need them. 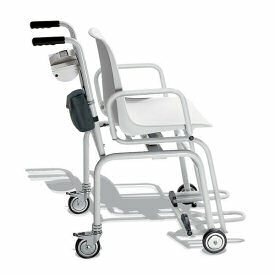 Integrated Weighing SeatYa don't have to stand up to get your weights anymore thanks to the Seca 954. Just have a seat in the chair, your weights will be displayed at the rear of the scale for easy reading by a doctor or nurse. Hold FeatureWith this cool feature you can weigh, press the "hold" key, and get off the scale. After you get off the scale, your weight reading will remain on the display. This feature will let you, (or your patient if you're a doctor or nurse) hop off the scale, then, record your weights. Auto-Off FeatureIf you've ever had the batteries in something run out because you forgot to turn it off, you'll realize what a blessing this feature is. When ya use the 954 with battery power, the scale will automatically turn off after a few moments of inactivity. 2 YEAR MANUFACTURER'S WARRANTY!Seca offers a two year warranty against defects in materials and workmanship. In the rare case ya have a problem with this health scale, contact Seca for a repair or replacement.